James Knox Polk, eleventh President of the United States, was born in Mecklenburg County, North Carolina, on the 2nd of November 1795. In 1806 he crossed the mountains with his parents and settled in what is now Maury county, Tennessee. He graduated from the university of North Carolina in 1818, studied law in the office of Felix Grundy (1777-1840) at Nashville in 1819-20, was admitted to the bar in 1820, and began to practice in Columbia, the county-seat of Maury county. After two years of service (1823-25) in the state House of Representatives, he represented the sixth Tennessee district in the National House of Representatives from 1825 to 1839. In the party conflicts which succeeded the presidential election of 1824 he sided with the Jackson/Van Buren faction, and soon became recognized as leader of the Democratic forces. He was speaker from 1835 until 1839, when he retired from Congress to become governor of Tennessee. His administration (1839-41) was successful, but he was unable to overcome the popular Whig movement of that period, and was defeated in 1841 and again in 1843. When the Democratic national convention met in Baltimore in 1844 he was mentioned as a possible candidate for the Vice Presidency, but was suddenly brought forward as a "dark horse" and selected to head the ticket. Finding it impossible under the two-thirds rule to nominate their candidate, the followers of Van Buren brought forward Polk, who was popular in the South, in order to defeat Lewis Cass and James Buchanan. George Bancroft, the historian, has asserted that this suggestion came originally from him, and Gideon J. Pillow, Polk's intimate friend, did much to bring about the nomination. 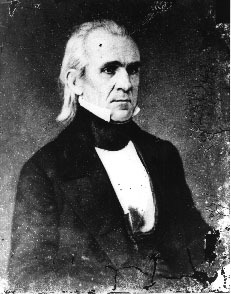 The unequivocal stand of Polk and his party in favor of the immediate annexation of Texas and the adoption of a vigorous policy in Oregon contrasted favorably with the timid vacillations of Henry Clay and the Whigs. Polk was elected, receiving 170 electoral votes to 105 for his opponent Clay. In forming his cabinet he secured the services of James Buchanan of Pennsylvania, as Secretary of State, Robert J. Walker of Mississippi, as Secretary of the Treasury, William L. Marcy of New York, as Secretary of War, and George Bancroft, then of Massachusetts, as Secretary of the Navy. There is no doubt that each of these men, and Bancroft in particular, influenced the policy of the administration, yet the historian James Schouler, who has made a careful study of the Polk papers, is doubtless correct in saying that the president himself was the "framer of the public policy which he carried into so successful execution, and that instead of being led (as many might have imagined) by the more famous statesmen of his administration and party who surrounded him, he in reality led and shaped his own executive course." Bancroft's opinion is that Polk was "prudent, far-sighted, bold, exceeding any Democrat of his day in his undeviatingly correct exposition of Democratic principles." The four chief events of President Polk's administration were the final establishment of the independent treasury system, the reduction of the tariff by the Walker Bill of 1846, the adjustment of the Oregon boundary dispute with Great Britain by the treaty concluded on the 15th of June 1846, and the war with Mexico and the consequent acquisition of territory in the south-west and west. The first three of these were recommended in his first annual message, and he privately announced to Bancroft his determination to seize California. The independent treasury plan originated during Van Buren's administration as a Democratic measure; it had been repealed by the Whigs in 1841, and was now re-enacted. Protectionists contend that the tariff legislation of 1846 was in direct violation of a pledge given to the Democrats of Pennsylvania in a letter written by Polk during the campaign to John K. Kane of Philadelphia. Briefly summarized, this letter approves of a tariff for revenue with incidental protection, whereas the annual message of the 2nd of December 1845 criticizes the whole theory of protection and urges the adoption of a revenue tariff just sufficient to meet the needs of the government conducted on an economical basis. It is difficult to determine whether this was always his idea of incidental protection, or whether his views were changed after 1844 through the influence of Walker and the example set by Sir Robert Peel in Great Britain, or whether he was simply "playing politics" to secure the protectionist vote in Pennsylvania. The one overshadowing issue of the time, however, was territorial expansion. Polk was an ardent expansionist, but the old idea that his policy was determined entirely by a desire to advance the interests of slavery is no longer accepted. As a matter of fact, he was personally in favor of insisting upon 54-40 as the boundary in Oregon, and threw upon Congress the responsibility for accepting 49 degrees as the boundary, and he approved the acquisition of California, Utah and New Mexico, territory from which slavery was excluded by geographical and climatic conditions. Furthermore a study of his manuscript diary now shows that he opposed the efforts of Walker and Buchanan in the Cabinet, and of Daniel S. Dickinson (1800-1866) of New York and Edward A. Hannegan (d. 1859) of Indiana, in the Senate, to retain the whole of Mexico, territory in which slavery might have thrived. At the close of his term (March 4, 1849) Polk retired to his home in Nashville, Tennessee, where he died on the 15th of the following June. Subject of a song by They Might Be Giants.